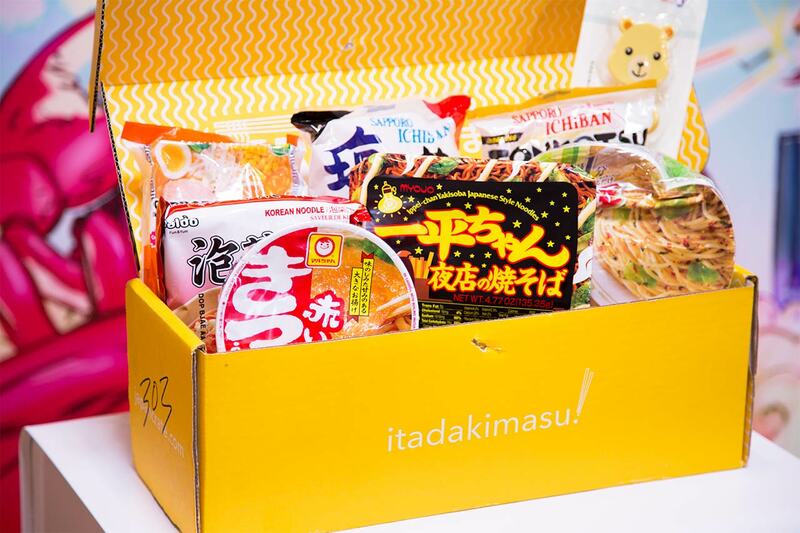 Umai Crate: The Definitive Seven-Month Long Review Does MSG make your mouth moist? If so, we have the subscription box for you. Last year, we published two six-month mega reviews of both Japan Crate (Japanese snacks) and Doki Doki Crate (cute Japanese things). These were, and still are, a couple of the most popular Japan-related subscription boxes out there. While we enjoyed opening twelve boxes of Japanese toys and candy, it was a relief to get it all done. But just as we started celebrating, we got the news. 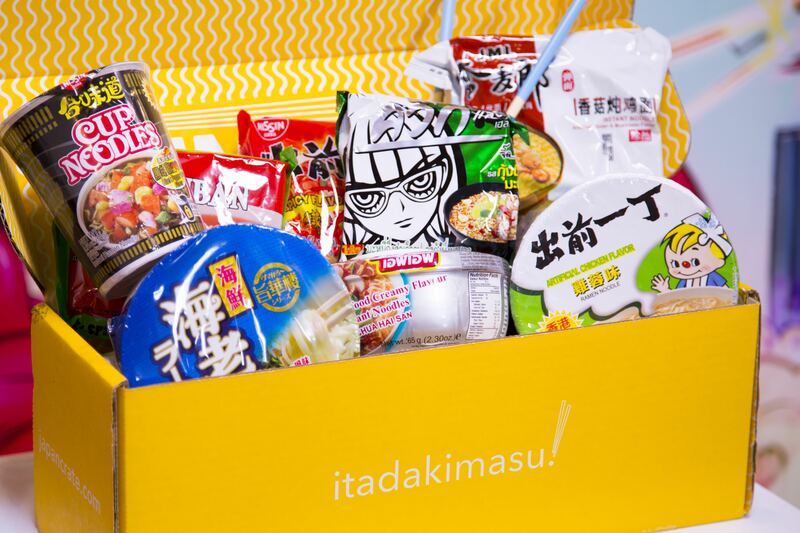 Japan Crate was launching a new service, Umai Crate, that sends out monthly boxes of instant noodles to its customers. So here we are, seven months later, bellies full of ramen and veins pulsing with MSG. 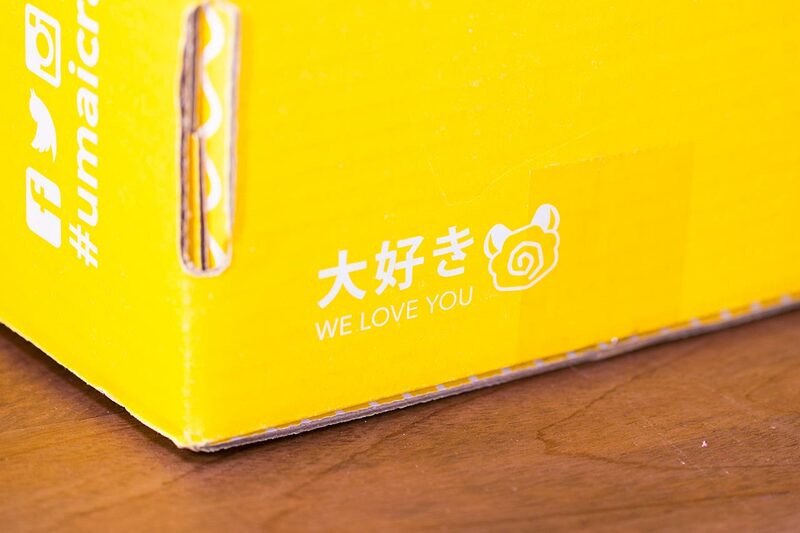 We let the Umai Crate boxes roll in for seven months, catalogued them, tasted them, and compiled data. Now it's time to reveal the noodlefruits of our labor. 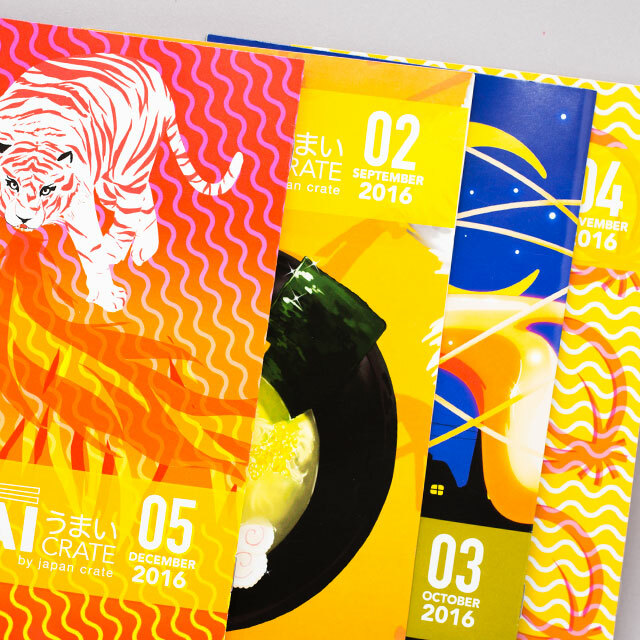 Prepare to dive deep into each month's box and finally learn if Umai Crate is the Japan-related subscription box of your sodium nitrate infused fever dreams. Note to the reader: Tofugu was not paid to do this Umai Crate review, nor were we given free boxes. We paid for the boxes ourselves, so they couldn't secretly give us any special treatment. Rest assured, we got the same service as everybody else. *You can lower your monthly payment if you prepay in blocks of 3, 6, or 12 months. Box contents are predictable, in that "instant noodles" is a narrow category. It's not like "candy" or "toys," both of which encompass whole landscapes of variety. If you don't like ramen, soba, or udon, turn back now. Thanks to Japan Crate's recent move to Japan, shipping for all the company's boxes is now absolutely free anywhere in the world! Unless you live in one of the countries they don't ship to. If so, sorry. No noods for you. 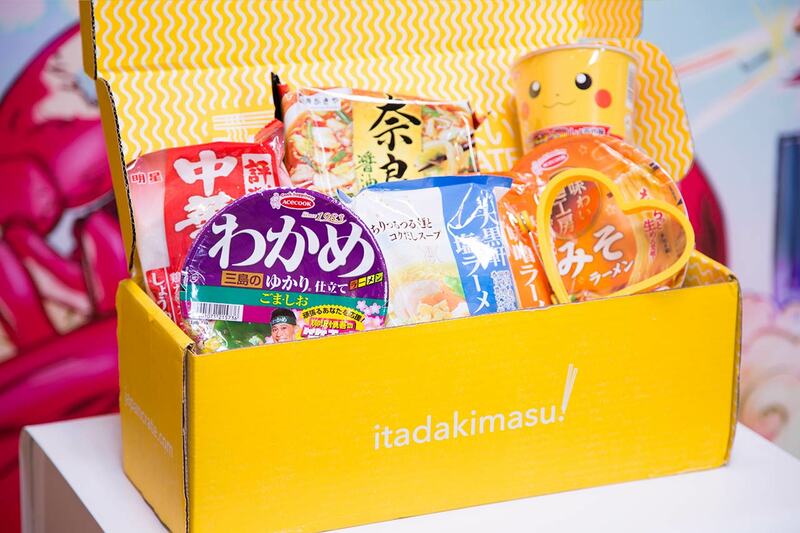 Unlike Japan and Doki Doki Crate, Umai Crate has no monthly raffle for a premium box of goodies. With the two services we previously reviewed, all subscribers get entered into drawings to win super boxes filled with plushies, books, game consoles, toys, and more. This can't really be called a perk because you'll probably never win, but even so I was disappointed to see "super box giveaway" missing from Umai Crate. What premium noodle goodies could have been included? A giant Cup Noodle you can swim in? Tickets to the Momofuku Ando Instant Ramen Museum? I guess we'll never know. Or maybe we will, when they add it after reading this Umai Crate review. 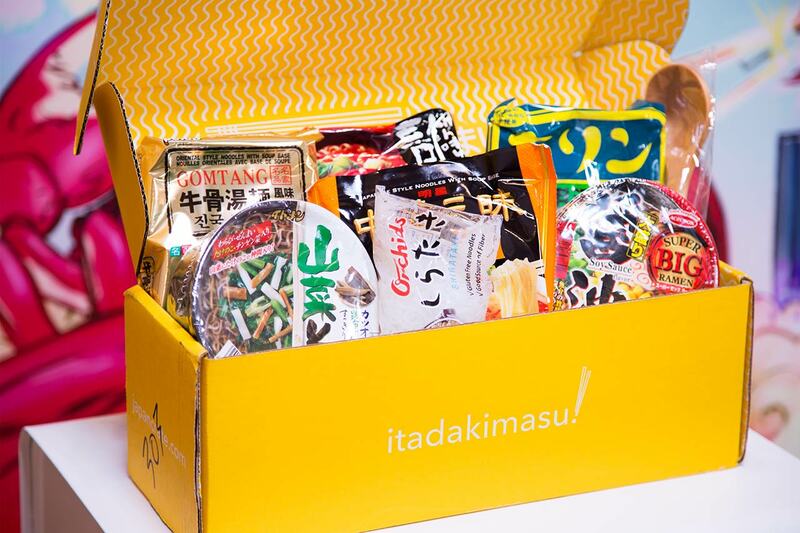 Umai Crate is a monthly subscription box of instant noodles. That means ramen, udon, soba, and pretty much any other noodle that can be instant-ed. Though there's no "super box" raffle, there is a monthly giveaway for Umai Crate subscribers. Most of the time, the requirement is taking a picture of your box with a certain hashtag, or something like that. The prize is usually something simple, like a ramen bowl and spoon set. But considering first and second prizes are often awarded, at least there's a chance you might win. Unlike Japanese toys and candy, there aren't many competing monthly ramen boxes on the market. As far as we can tell, there are only a handful of others, and some competitors have already thrown in the towel. 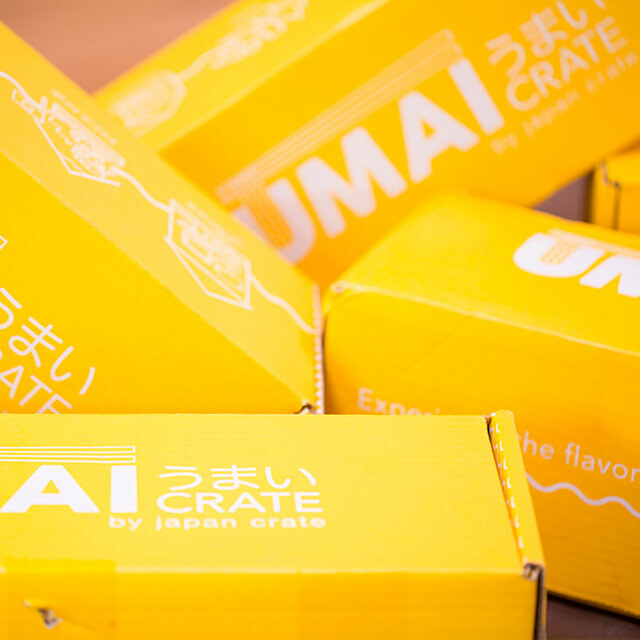 Is Umai Crate awesome enough to expand the market? Or will it fold like dried noodles in a rainstorm? Get ready to dig into seven piles of noodles, followed by our thoughts and a final verdict. Here we go! The very first month of Umai Crate. Our initial impression matched our expectations: there were noodles in the box. Good thing we're noodle fans. "I definitely enjoyed the mustard flavor and the mayo topping." A basic kitsune udon with a big piece of agedofu. It's a fine choice for the noodle noob. Great kimchi flavor, and not overly spicy. If you're not into spicy foods, don't fret. You can still eat it just fine. The first in a trio of Sapporo Ichiban products we get this month. This one's a salty boy. Good ol' reliable miso. You'll never steer us wrong. Or will you?! Maybe in the future, but not this time. Chopsticks that help babies learn how to use chopsticks. Since this is the first month, Japan Crate is assuming you're a ramen-eating baby. The picture in the pamphlet got our hopes up. If you've ever been to a summer festival in Japan, you'll know why. Unfortunately, the flavor didn't match our memories of those humid summer nights. It was tasty, but not the yakisoba experience we were hoping for. Michael enjoyed the mustard flavor and the mayo topping, so thumbs up for that. But if it came with beni shouga, that would've bumped it a level on the thumbs up scale. Though Japan Crate can't alter the packaging, maybe they could add garnish packets for certain dishes. Since we opened the inaugural August box seven months after receiving it, this spaghetti was expired. Even so, the expiration seemed a little soon to us (December 23rd, only 4 months after we got the crate in August). The package was dented, almost to the point of puncturing, but the dent didn't go all the way through, so it was still okay to eat. The broth was super garlicky… and that's it. There were no other flavors peeking their heads out past the waves of garlic, not even the titular peperoncino. 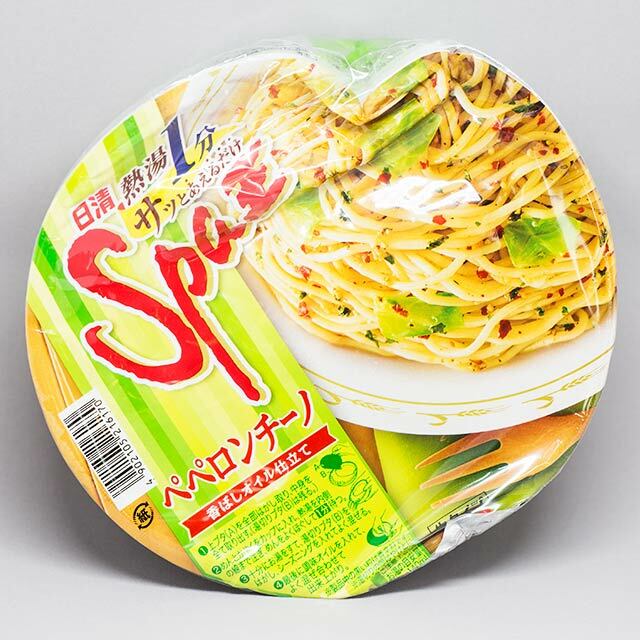 Spa Oh is a quality brand of Japanese noodles, but unfortunately it was the only Spa Oh out of seven months of Umai Crate. So the selected flavor (peperoncino) was disappointing. We were hoping to eventually get a more typically Japanese flavor like mentaiko, but no such luck. Welcome to Box 2, baby. This one offers a little more variety than the first. The Tofugu office had more favorites this time around, and it was fun to get two Korean noodle packs as well. "The broth tasted like ordinary shoyu flavored ramen, simple and subtle." The most important thing is the minimalist package design with the cute giraffe. Aside from that, it had a subtly salty flavor. Really salty but still a solid choice for inclusion. Tasty broth and a generous amount of noodles. Interesting texture, too. This is a super hot Korean ramen popular with Japanese tourists in Seoul. We found this ramen to be quite tasty, and the sauce included made a hearty broth. Jamal said he would buy it if he ever saw it in a store. Interesting addition, seeing as shirataki are yam noodles used as an ingredient in cooking, not a ready-to-eat instant meal. We felt Umai Crate would benefit from more variety and/or additions like this. A wooden spoon you can use to sip broth. Now you can be a real cooking mama. These thin Korean noodles in a peppery broth made for an overall creamy delicious dish. At first glance, the completed meal didn't look too filling, so we added a couple of soft boiled eggs. Not only did it manage to fill us up, the eggs paired well with the chicken flavor. We were glad to be introduced to this noodle and would buy it on its own if we ever run into it in the wild. The broth for this ramen is an ordinary shoyu. Not bad, but nothing special. Luckily, there were naruto and corn added for garnish, but they were both rather tiny. Overall, this is a basic ramen you can find with a little effort. A solid choice if you're hungry (there's a lot of noodles), and you don't mind salt (there's a lot of salt, too). If you're out shopping at an Asian grocery store, look for this one and try it for yourself. There's nothing wrong with it (unless you hate salt), but because it's so common we wondered why it was featured in a subscription box. Umai Crate started improving with this box. Maybe some autumnal magic seeped in through the cracks. The weakness of the first box was gone, and we started to see a little more variety. There's even a little ramen toy (not for eating, babies). "Delicious broth and I loved the taste and texture of the oil coating the noodles." A standard udon you can get at most Asian grocery stores, but definitely a solid choice. Nice to see more yakisoba. One of the best noodle types there is. Eat this ginger ramen if you're sick, because man, it is gingery. Settles the stomach, but gingers up the throat. Super hearty and delicious, with the consistency of a curry. It takes a couple of extra steps to prepare, but it's worth it. Noodles with a Canton style soy sauce. We liked seeing non-Japanese noodle styles. Offerings like this help mix it up and keep things interesting. A very tasty broth with superb texture. The sesame oil in this ramen adds a pleasant flavor that separates it from other noodles in this box. A little toy ramen sampuru, which helps you remember the good time you had eating ramen. Not bad for being such a tiny li'l guy. It was packed with veggies; plenty of green onion, bamboo shoots, and corn. But otherwise this was very average and Cup Noodle-like. That's not necessarily a bad thing, though. This month, Umai offered up a Southeast Asian curry and a Hong Kong style seafood ramen. There was a lot to love, plus we got chopsticks to add to our collection. This is a solid choice on a cold day, but the block of tofu was a little tough. That might just be the nature of freeze dried tofu, though. Regular shoyu ramen with a giant packet of onions for flavor. Definitely sour. The broth was tasty because it came with an oil packet. And not too hot for a "spicy" dish, which could be good or bad depending on your personal taste. A Southeast Asian curry that's highly rated by noodle connoisseurs. We rate it highly, too. A Hong Kong style ramen with seafood. More chopsticks for that collection, growing to a healthy size by now. You can never have too many chopsticks. Put these with your baby chopsticks and wooden spoon. At first glance, this ramen didn't seem like much. It's in a bag rather than a cup, after all, so it's more effort. Plus, it's shio flavor, arguably the most basic ramen broth (nothing wrong with shio, just saying… it's salt). Contrary to our initial judgments, this turned out to be one of the best ramen we ate. Overall, it's a top quality noodle, different than other, more simple shio ramen, like those made by Sapporo. The complexity of the broth shines through. It's a well-balanced mixture of different kinds of oil and spices. 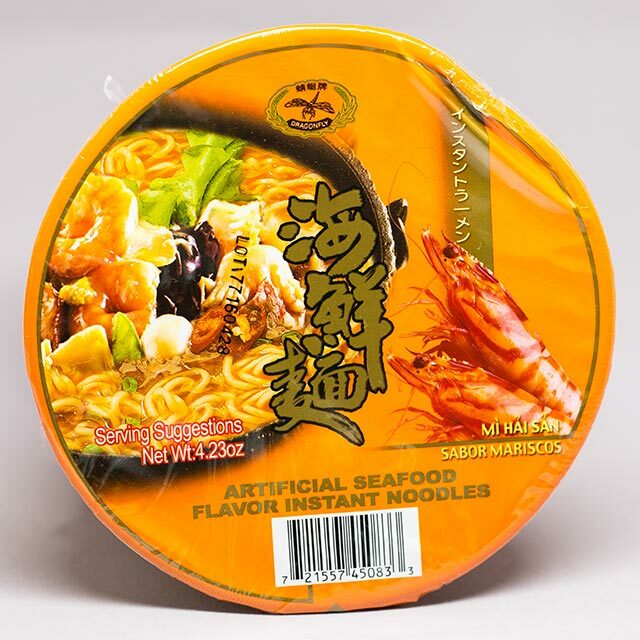 High quality, delicious noodles with awesome seafood flavor. For those worried about the "fishiness" of the seafood element, fret not. It complements the other flavors and textures well. The narutomaki and other vegetables in the dish were a hit with us, too. Side note: this is the second noodle package that arrived dented (The first was Nissin King Spa Oh Peperoncino Spaghetti). Lucky for us, it wasn't punctured so we were still able to eat the contents inside. Though these two dented items may seem like metaphorical dents in Umai Crate's reputation, they're really not. These things happen when shipping boxes upon boxes of product. And two slightly dinged bowl out of seven crates is a great record, if you ask us. "This was a very "normal" ramen. Lots of salt. Lots of noodles." Noodles in a weird-shaped bowl questionably labeled "Sauce Flavor." Comes with a fork. Another Southeast Asian soup, this time with coconut. Can't go wrong with kitsune udon. If foxes like it, you know it's good. Very spicy. We couldn't taste anything past all the spice, unless "pain" was supposed to be the flavor. Flavor was bland, but a generous quantity of noodles. A place to put your hashi while you eat. Quack quack! If you're sensitive to spice, watch out. This ramen was made for heatseekers. The seafood toppings were too small to notice, which is unfortunate because "seafood" is in the name. That said, it was the best of this box. The spice made up for any shortcomings. 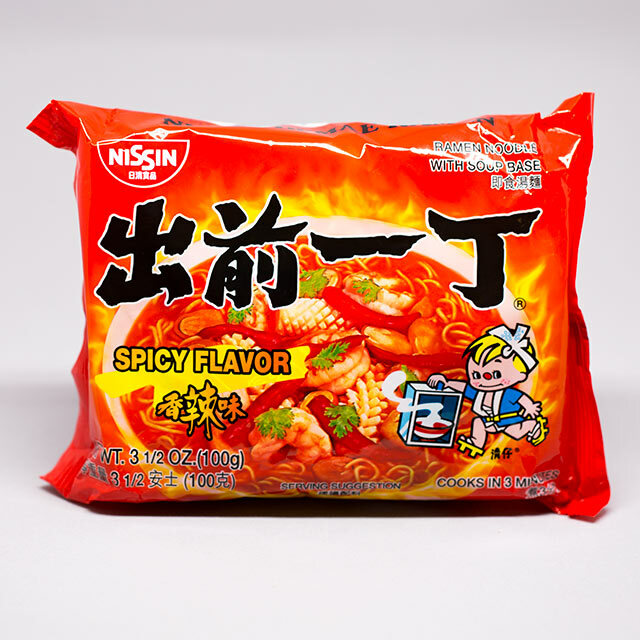 Bottom line: Nissin Spicy Seafood ramen will warm you up on a cold December morn. Just keep ice on hand to give your tongue cool down therapy afterward. 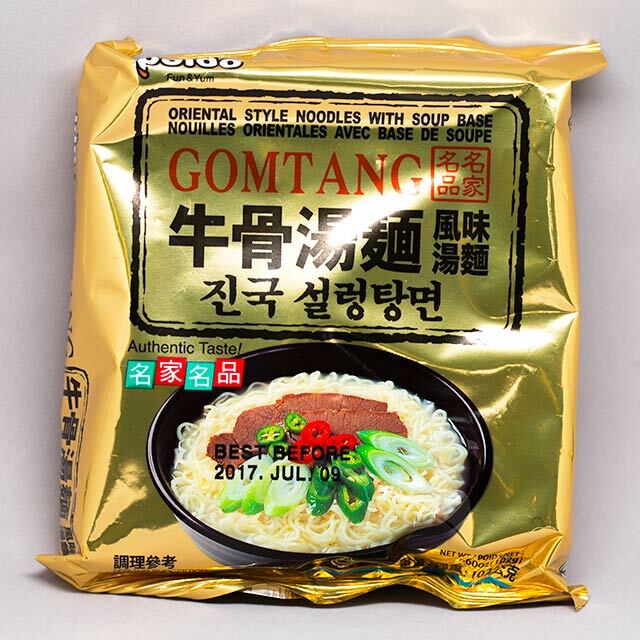 This is a common ramen to find at your local Asian grocer. On the plus side, you get a lot of noodles, and we mean a lot. Also, heaps of salt (good or bad, depending on how much you like salt). Unfortunately, the toppings were nothing special. They were so tiny, they might as well have not been there at all. That's par for the course with instant noodles, though. Not many have big, meaty toppings. 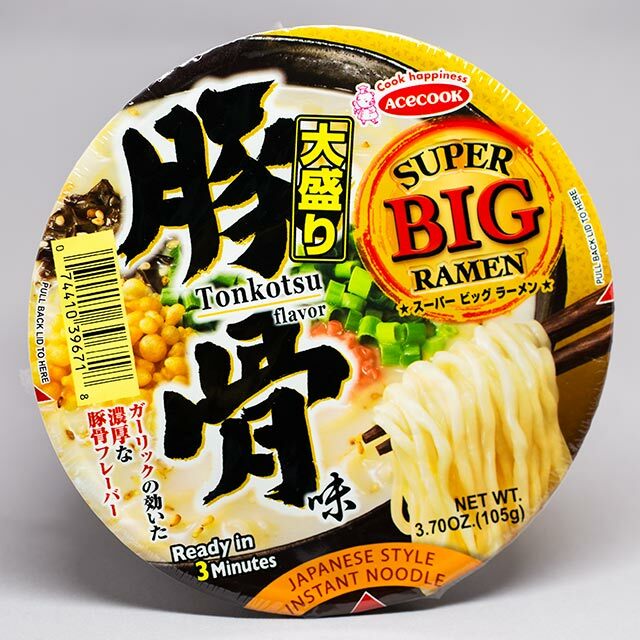 If you've got an empty stomach, Acecook Super Big Ramen is for you. If you're looking for a special ramen experience, maybe not. Finally, six boxes in we get a theme. This is what Umai Crate needs, and we hope they keep it up going forward. Even though the theme of this box was "pain in the form of spice," we'll take it. Pain is very memorable, and that's what a subscription box should be. "Overall, a tasty experience initially, but it gave me a headache afterward." Any goodness in this bowl can be attributed to the sesame-shoyu-miso oil packet we poured on after the noodles were finished. Unfortunately, the veggies tasted weird and stale. This had a more subtle flavor than other ramen we tried. They are not kidding around with that black pepper. Damn. Not much crab either. Oh my god, more spice! A quality ramen, but spicy. Nice to get some mushroom flavor. Strange that the Umai Crate manga-zine insert says, "highly suggest adding some chicken…to help bulk it up." Sounded to us like Japan Crate was talking smack about its own product. Weird. Cool package, but oh wait. Spice again. More tasty pain! Spicy at first, but the lime flavor balances it out. It was delicious, but it hurt. "Don't eat your food with pencils!" they'll say. Then they'll notice the pencils are really chopsticks. Classic goof. Although package says "SPICY FLAVOR" in all caps, it was fairly mild and not really spicy at all. And even though the picture on the package shows a bunch of seafood, there wasn't much seafood to speak of, either. The teeny noodles were bland and soaked up the broth too quickly, making the end result more like a squishy noodle casserole. On the plus side, check out that mascot: a cute li'l boy with a red nose. Look at him run, possibly for his life. Thumbs up for package design, at least. You thought we were done? Well, so did we. We initially planned to make this a six-month review, like our last two. But then Japan Crate announced it was moving the company to Japan, so we had to stick around to see what this, the first box from 日本 would hold. The answer: better quality and a little (little) more variety. 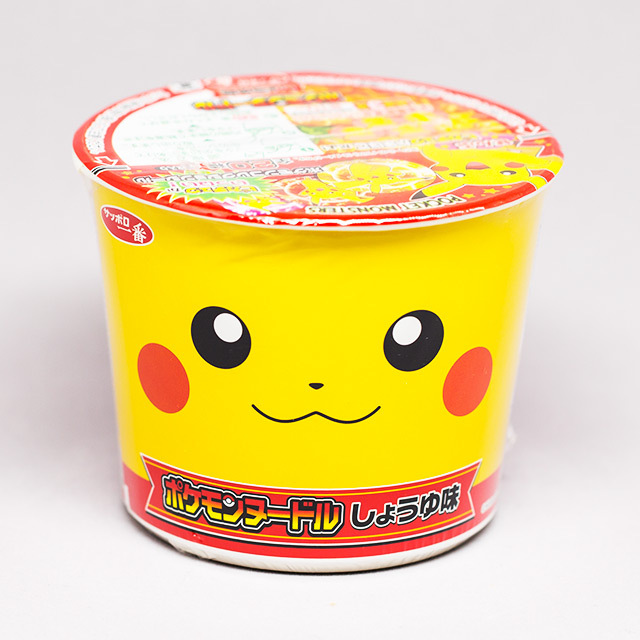 Plus, there's a Pikachu ramen. If this is a sampling of Umai Crate's future, then we might stick around after the review to try out the next few boxes, as well. "The noodles had a surprisingly perfect springiness to them that you don't often find in instant ramen." Nice to get soba in the mix, and shoyu flavor no less. Nice. A regional ramen from Nara in Kansai, the birthplace of Mami. And this is the other one. They're both good, both basic. We were glad to have them, but not excited. The highlight was the noodles. They gave that certain special spring in your jaw when we chomped down. Tasty enough. Reminded us of angel hair pasta. Not outstanding, but filling. How could you not want to eat this kawaii noodle featuring everyone's favorite electro-boy? The cute package and promise of a sticker was too much to resist. While the cuteness was definitely worth it, this was one of the most bland ramen in all seven boxes. Not very salty, no dominant flavor, but it did have kamaboko with Pikachu's face on it, so it definitely got a thumbs up as an otaku fan snack. As soon as we opened this box, Jamal claimed this molder (curse you, Jamal!). He got to keep it, but he had to make us heart-shaped eggs for a year. A small price to pay for such an awesome egg mold. Though you can probably nab something like this off of Amazon these days, these kinds of kitchen accessories remind us of the 100 Yen Store, a special, magical place, if you've never been. Now that we've examined each bowl of ramen, udon, and soba individually, it's time to put on our powdered wigs and black gowns. It's judgment time. We're going to zoom out and look at Umai Crate as a whole. Maybe this is an unfair comparison, but after reviewing both Japan and Doki Doki Crates, it's hard not to judge Umai Crate's variety in light of our feelings about those services. With the candy and toy crates, there was a certain impact, a "wow factor," when you opened each box. With Umai Crate, we didn't get that same sense of anticipation from box to box. We just opened the crate and… noodles again. For this reason, we didn't score Umai Crate highly in the Variety category. It should be noted that Japan Crate the company has less to work with in this situation, but there's one thing they could have done to help this difficult situation: themes. It wasn't until box six in January that we got any sense of curation. Showcasing variety with instant noodles is more difficult, but it's by no means impossible. Themes would have showcased the organization's creativity, but sadly this didn't happen. Yikes. That's a lot of ramen. A lot of the variety issues could be easily fixed by upping the numbers of other types of noodles in each box. Mix in a few udon or soba themed months, and problem solved. Another way Umai Crate could mix it up while simultaneously expanding its potential customer base: add a few veggie options each month. Our staff translator, Kristen, is a vegetarian, so she got to eat exactly zero noodles from all seven boxes. We kept hoping the next box would have something for her to try, but no dice. Though adding veggie ramen might not sway vegetarians to subscribe individually, those in roommate or family situations with vegetarian members might do so knowing everyone can take part in the noodle fun. The uniqueness of this service, meaning the rare and interesting individual items offered, was okay. It could be a lot better. We got some semi-unique flavors like spicy ramen, ginger ramen, and sour pickle cabbage ramen. 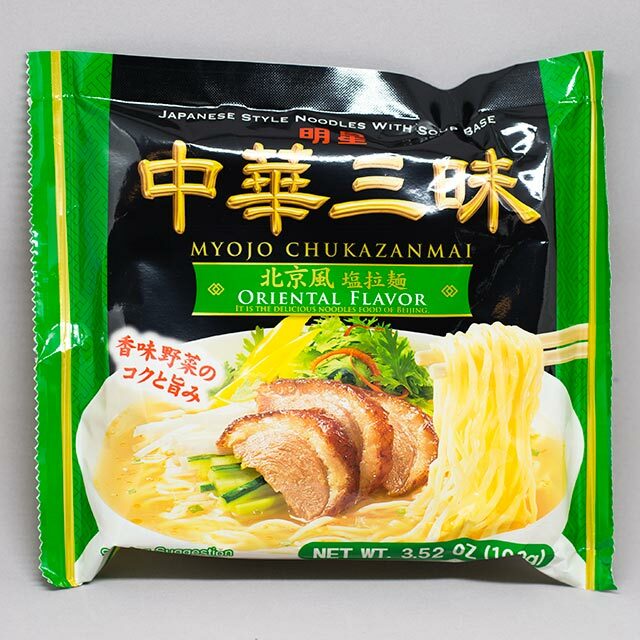 But what about instant noodles that are collaborations with famous ramen restaurants? These aren't rare in Japan (you can find them at any konbini), but they're super special to customers in the US and around the world. 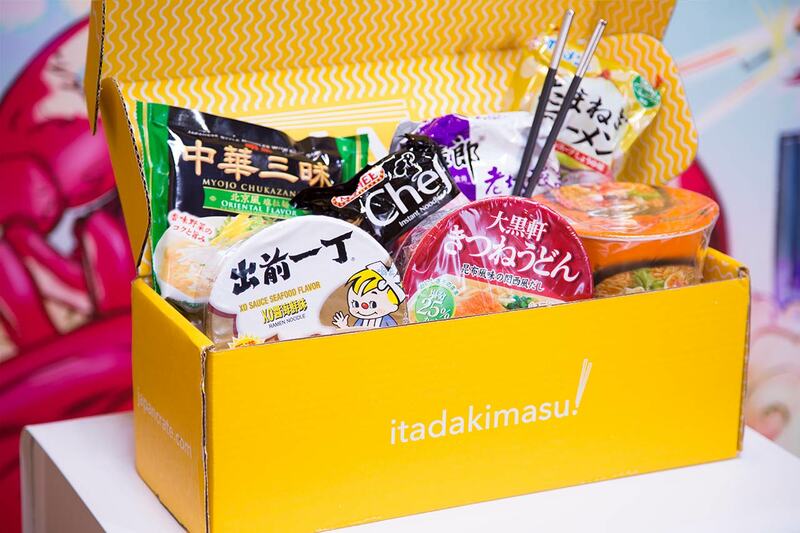 If Umai Crate wants to get unique, boxes should include kawaridane 変わり種（か　だね） noodles (noodles with strange flavors). Seeing shoyu, shio, miso, and tonkotsu ramen in box after box got boring. But 変わり種（か　だね） noodles could have fixed this. These aren't rare, either. 変わり種（か　だね） noodles have been trending in Japan for the past couple years. The two big cup yakisoba brands, Myojo Ippei-chan and Peyoung, both released chocolate flavored yakisoba, which we really wanted to try ever since we first saw them on social media. We were hoping Umai Crate would be our chocolate noodle savior, but no such luck. The "strange" noodles don't even have to be that strange. There's tom yum flavored Nissin Cup Noodle, cilantro flavored Peyong yakisoba, and okonomiyaki flavored UFO yakisoba. Any of these would up the "wow" factor in each box, and keep customers subscribing month after month. Maybe this will change now that Japan Crate is based in Japan, and we'll finally get our long-awaited chocolate noodles. As with all Japan Crate brand boxes, the "box" aspect of Umai Crate's presentation is strong. 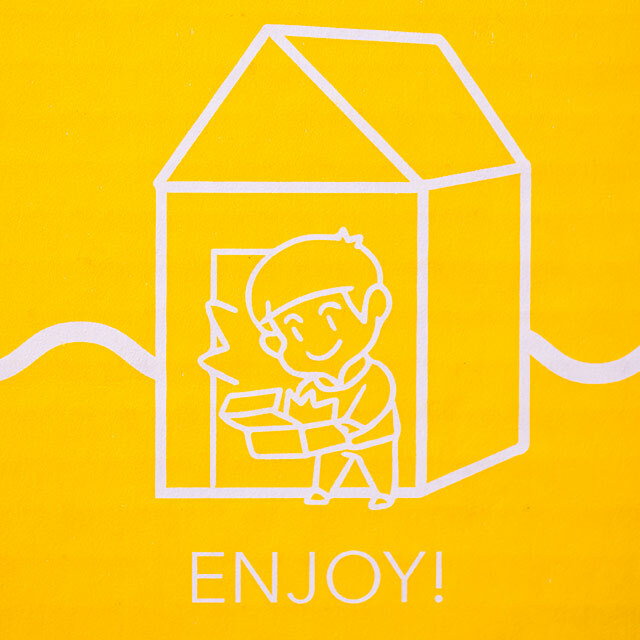 You get a solid color box with illustration on it, tissue paper inside, and everything packed nicely. No complaints there. In all our boxes, only two items arrived damaged: Nissin King Spa Oh Peperoncino Spaghetti and Dragonfly Instant Noodles Seafood Flavor. But even then, it was only slightly dented so there was nothing keeping us from eating the food inside. Two dented items out of seven boxes is pretty good. 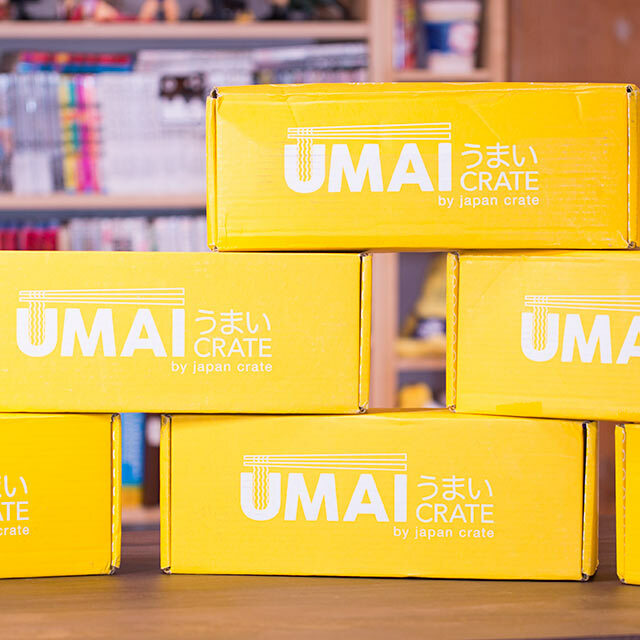 The Umai Crate unboxing experience is a pleasure, as it is with Japan Crate's other products. The box is a solid color and the inside sports an allover pattern in white. For Umai, the allover pattern is noodles, of course, and it looks positively fetching. It's an obvious choice, but it works so well. All the tissue paper in our boxes were bright pink, which complements the yellow crate, making the inside "pop." And this pop is sorely needed when you're looking at a pile of instant noodles. The pack-in "manga-zine" (as Japan Crate calls it) is the same length, six pages, as the one we got with our Doki Doki Crate. It describes each item in the box, shows off fan photos, and sometimes has an article that teaches about instant noodle culture in Japan. Our main disappointment was the lack of manga (it is called a "manga-zine," after all). The other two boxes we reviewed had manga in their pack-in zines, but for some reason Umai Crate gets no such love. It's a shame because Umai has cool mascots; a muscly ramen chef and his pet white tiger cub. We bet they get into all kinds of adventures, but we'll never know until JC starts writing manga for them. Though the pack-in manga-zine was fine overall, there was one thing that stood out: typos that a Japanese speaker could easily catch. For example, the word ebi 海老（えび） (shrimp) was translated as "Old Ocean." Even if you're not a native Japanese speaker, just drop "海老" into jisho.org and you get "shrimp." It takes considerably more effort to look up "海" to get ocean, then look up "老" to get old, and smash them together to make "old ocean." We know Japan Crate isn't a sketchy company, but this little detail sent out "sketchy vibes" to our native Japanese staffers. Hands down, the best noodles came in the last month, after the company moved shop to Japan. Before the move, the quality was not so great. 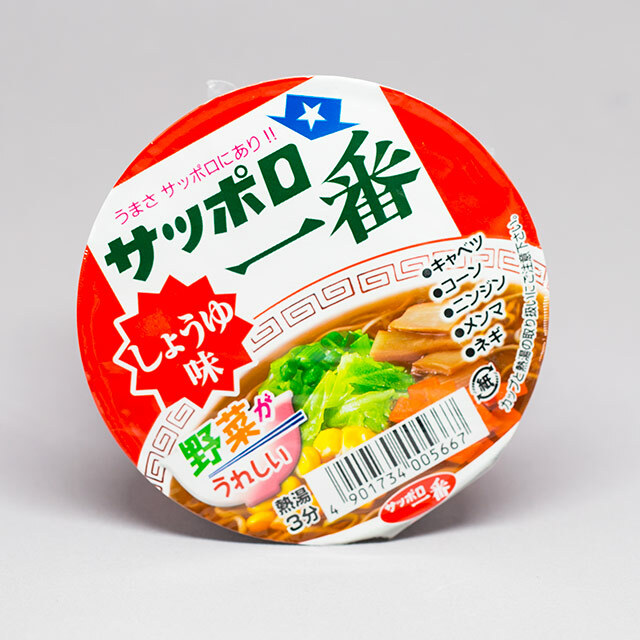 Tofugu staff who were born and raised in Japan felt the quality across all seven boxes was not very good, compared the high quality instant noodles they grew up with. The seasoning for most noodle offerings in Umai Crate is powder-based. 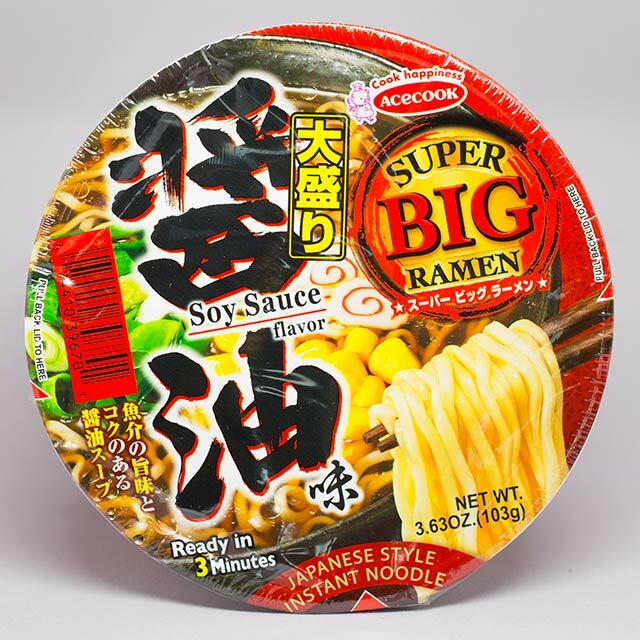 High quality instant noodles mostly use powder plus a liquid packet made from fresh ingredients like miso, shoyu, and oil. This makes the noodles taste closer to what you'll get in restaurants. Receiving mostly powder seasoning lowered our opinion overall. The other major problem: too many bags, not enough cups. In general, instant ramen in cups is better quality than the bagged variety. It also means less hassle. Bag noodles require pots and pans to cook. It's a real pain and undercuts the convenience of instant ramen. You need measuring cups, pots, bowls, and a big ol' sink to clean everything up once you're done. 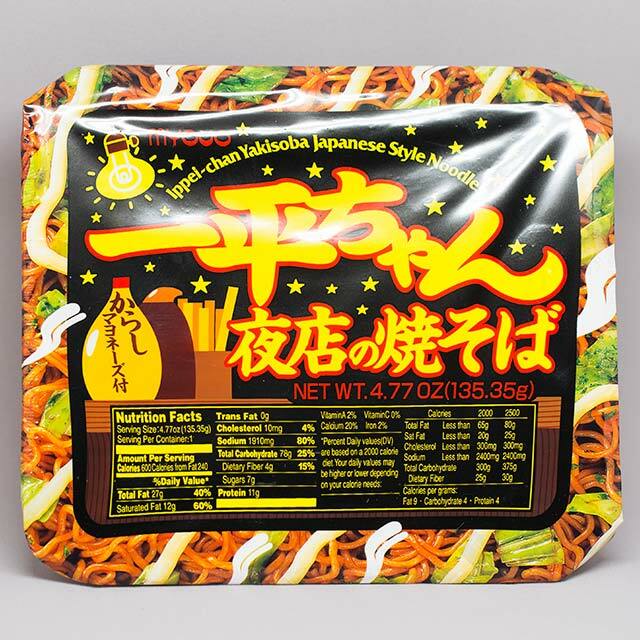 The seasoning for most noodle offerings in Umai Crate is powder-based. High quality instant noodles mostly use powder plus a liquid packet made from fresh ingredients like miso, shoyu, and oil. Also, cooking instant noodles on a stovetop yields mixed results because getting the temperature right for each product is tricky. One of our staffers cooked some of the Chinese noodles, but they got mushy because she had the heat too high. Umai Crate's pack-in English instructions don't mention a recommended heat like "medium" or "high." Just "cook noodles for 3-5 minutes," which is too vague and leads to noodles that are too hard or too soft. In defense of bag noodles, they're a fine choice for families who want to buy two or three of the same flavor to make a big meal. But for subscription box customers who only get one bag of each flavor, it isn't worth the hassle. As always, this is the most important category. 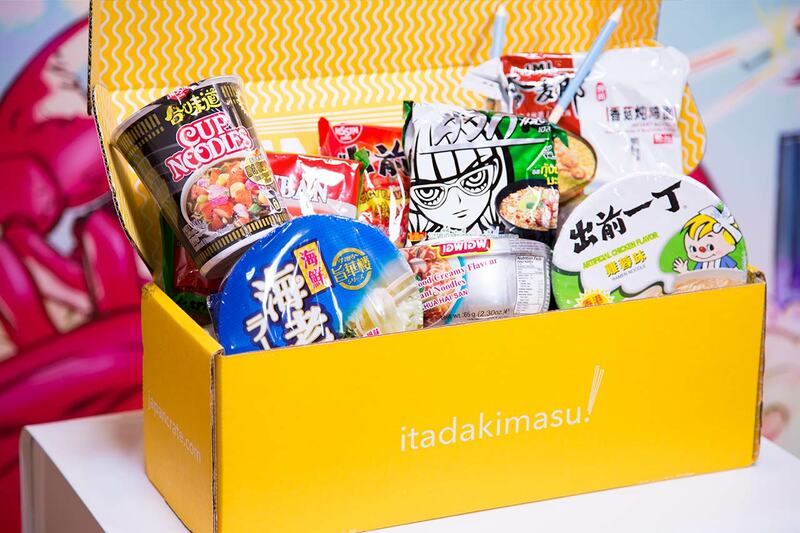 Subscribing to this ramen crate requires money, and it's good to know if you're getting your money's worth. To estimate the value of each box, we weighed the items to get an average. Then we calculated dollar value estimates for each item and averaged those as well. Please note: Estimating values for these crates isn't easy, and maybe not entirely accurate. We don't know which items Japan Crate buys in bulk, or if they have special agreements with noodle companies. Also, these numbers don't include taxes or shipping. That said, our estimate should give you a rough idea of the value you get as a subscriber. You spend $25 per box and get $10.04 worth of items. Is this worth it to you? It depends. How easily can you find these items and get them shipped to your house? Is it worth paying Japan Crate $14.96? Only you can answer that question. Plus there's the surprise element. It's really hard to surprise yourself, so it may be worth paying someone to amaze you with noodles every month. One more thing to consider: remember how we said, Umai Crate sent us more bagged ramen than cups? This is probably a money decision because popular brands like Sapporo offer both bag and cup versions. If you're choosing for yourself, you'd pick the cup version, for quality and convenience reasons. If you're trying to save some yennies, you'll reach for the lower quality bag version. This is a tough call to make. When we reviewed Japan Crate, it was easy to give a recommendation. After all, everyone loves candy. With Doki Doki Crate, it was a little tougher, but still easy enough. 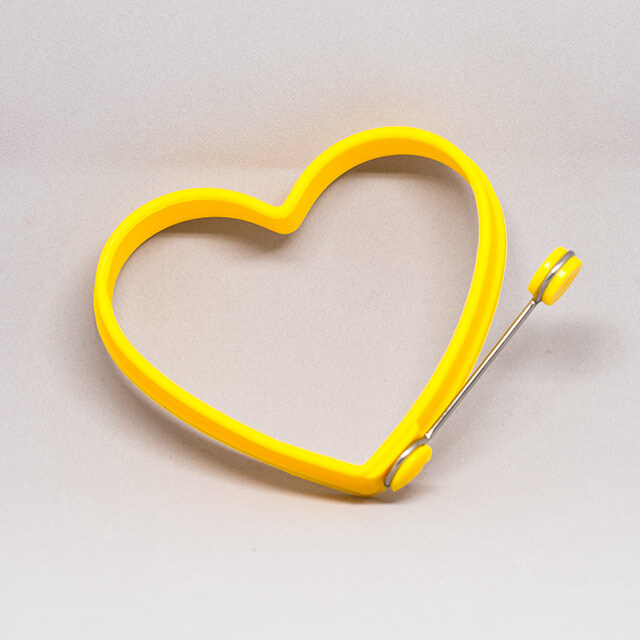 Most people love cute trinkets. But how many people love noodles, and specifically instant ones? If you're otaku, this could be a good three days of food a month. If you've got a big family, this could make for a fun "noodle night" dinner (the kids will look forward to the big yellow box in the mail). If you don't have an Asian grocery store nearby, this could be the perfect way to get your noodle fix. 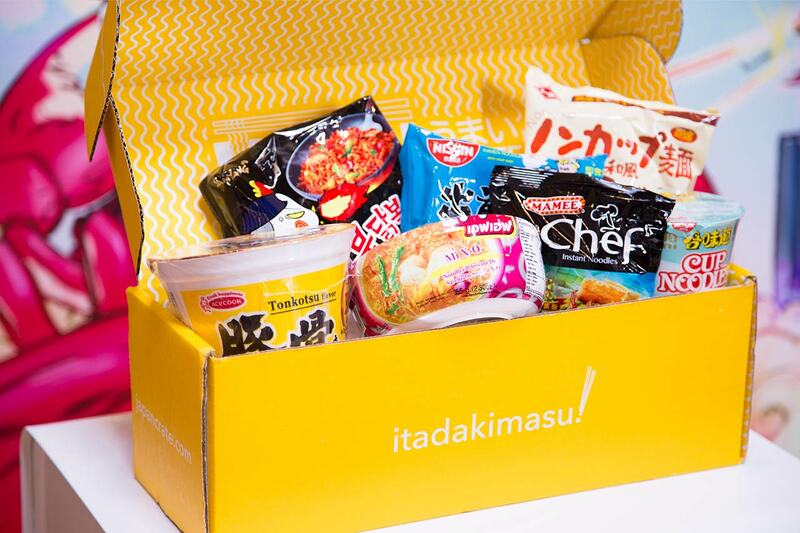 But for the average person or small family with easy access to instant ramen, Umai Crate might be too much. 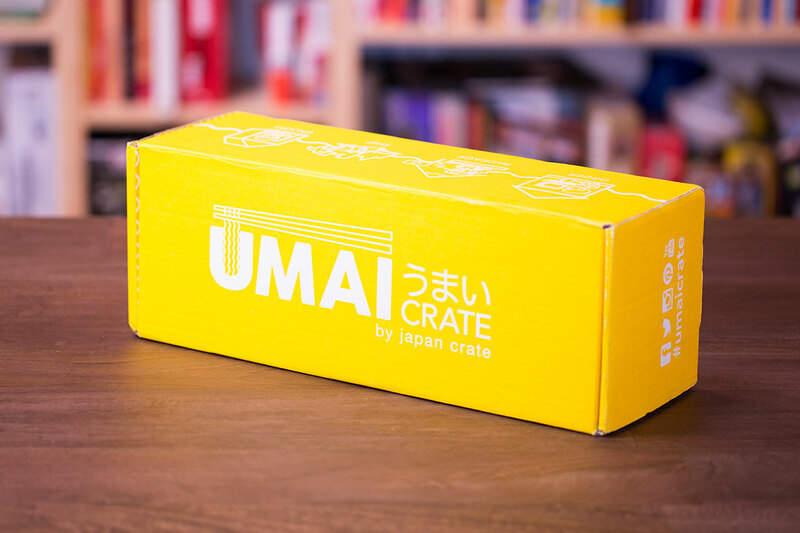 Honestly, Umai Crate feels like an afterthought for Japan Crate as a company. They do candy and toys really well. Even the newest makeup box (no, we're not reviewing it) fits with their brand identity. 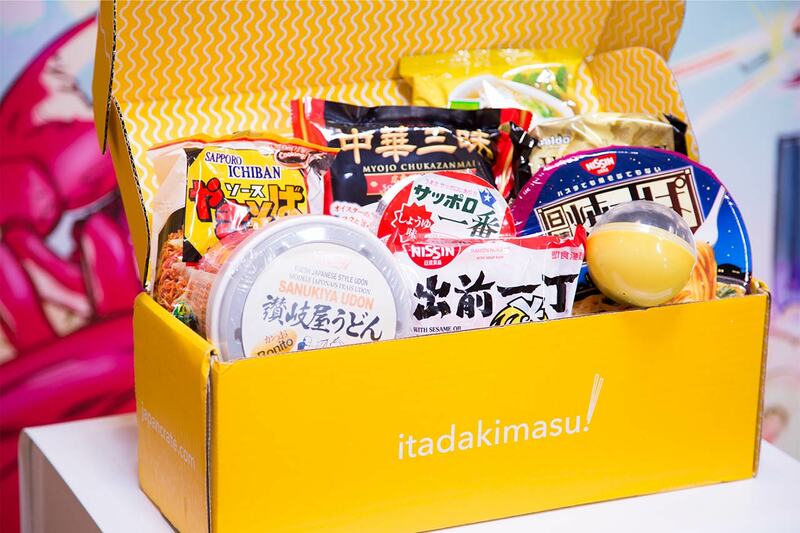 But the noodles feel like the black sheep, something the company "had to do" to keep up with competitors in the Japan Subscription Box category. The thing that makes other Japan Crate subscription services so good is the attention to detail in the curation, "manga-zine," and presentation. The overall experience feels exciting every time a box arrives. With Umai Crate, it didn't give us that same feeling. Granted, noodles are a tougher sell than candy and toys, but with a little effort and creativity Japan Crate could pull it off. If any company can do it, they can. The quality of the ramen was quite poor. I was constantly disappointed, and now we have a bin of expired instant ramen in our office because nobody is willing to take any of it home. If you don’t have access to a variety of Japanese ramen, then I can see Umai Crate fulfilling this purpose. In my context, where I live in a large enough city to have these kind of things available, I feel like Umai Crate isn’t a good value. A lot of the ramen aren’t particularly unique and interesting. I could get the same products for fraction of the subscription price. Or if you know what you are looking for you can get them online for way cheaper and at bulk amounts. Sorry, but not worth it! I’ll just give it 3 out of 10, just for people who live far from Asian grocery stores. For me living in Portland, I can find a lot of this stuff around here for a cheaper price. Might have been a good chance to try different things that I wouldn’t buy, but ended up not enjoying much anyway. I miss Japanese konbini with their amazing selection of cup noodle! This was, by far, my least favorite from the Japan Crate family of crates. I like instant ramen well enough, but I know it’s bad for me. If I’m gonna imbibe it, it needs to be the highest quality, in flavor and construct. Unfortunately, the ramen in these crates was some of the lowest quality. 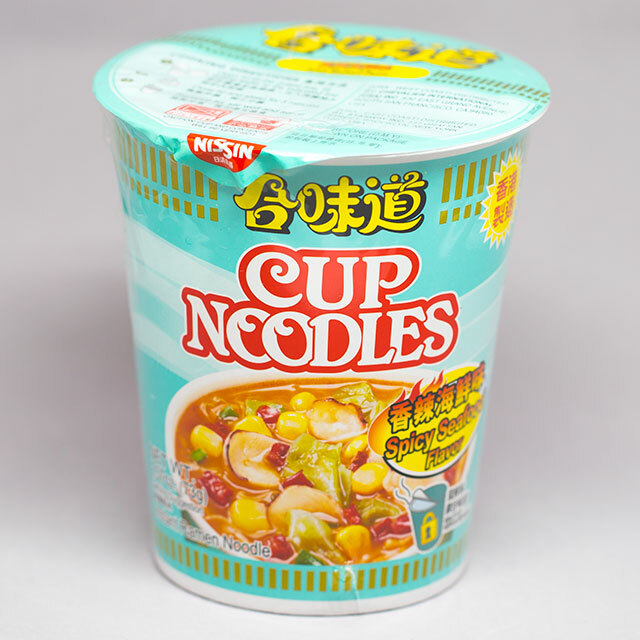 You could use the subscription money and import some awesome seafood cup noodle through Amazon. Do that. Don’t do this. I couldn’t eat any of this. How did they not include one, single vegetarian umai snack in seven months? You’re dead to me, Umai Crate.